When Tasoula Hadjitofi is in Cyprus, she can see her childhood home from the beach near Famagusta. But were she to take a step too far, beyond the high fence which even extends into the sea, it would cost her her life. This is not a hypothetical situation: several years ago Hadjitofi actually stood by that border. She rolled up her dress and carefully waded a few metres into the sea, alongside the fence, to get a better view of the city. This immediately caused great consternation amongst the Turkish soldiers on the far side of the barrier. The five men of the Turkish army, that has occupied her birthplace in 1974, trained their guns on her. ‘If you walk any further, we’ll shoot you,’ they threatened. ‘I stood there and thought, what law gives Erdogan or Turkey the right to kill me for just wanting to go home?’ Hadjitofi’s voice rose emotionally as she uttered the word ‘home’. Shortly afterward there was a threat of a second bombardment, causing the family to flee to Limassol where an aunt lived. ‘I can remember I was wearing yellow shorts. The six of us shared one suitcase. We put the animals in their cages with enough food for a few days. We were only going away for a little while until things calmed down in the city.’ Things went differently, as Turkey decided to occupy the city. Famagusta was transformed from a lively tourist resort into a ghost town. ‘The only thing I have left from that time is a friend book. The last page was written by the boy I was in love with. He was murdered – but his family still says he is missing. When Hadjitofi was eighteen she went to study in the United Kingdom. For years, she did not talk about what she had been through. ‘I danced, I sang and I didn’t want to face up to the fact that this was my history.’ This proved untenable; after moving to the Netherlands, she spoke out more and more on the subject. 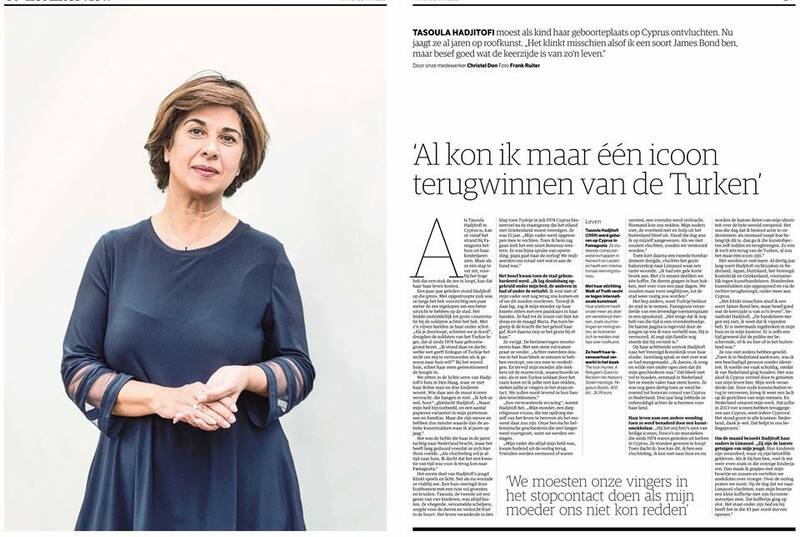 She was not even thirty when she was appointed Honorary Consul of Cyprus in the Netherlands. For three years, she voluntarily lobbied behind the scenes for her country. Tasoula Hadjitofi (1959) was born in Famagusta in Cyprus, which has become a ghost town since the Turkish occupation in 1974. She studied computer science in Norwich and Leiden and has an international recruitment agency for English-speaking professionals. She combats the international art trade with her foundation Walk of Truth. Hadjitofi wants to use her platform to motivate people all over the world (including refugees and immigrants) to give tips on looted art. This information can then be analysed by her global network. Tasoula Hadjitofi has recounted her life story in a book, The Icon Hunter, which is being published on Thursday, 11 April by Pegasus Books.